The ELTchat on Wednesday was about professional development. We are very much in favour of it. In fact, reading blogs, discussing issues, putting down your thoughts on paper and lapping up the views of others, trying out new activities and contemplating their effects, all this was posited as excellent ways of going about it. These last few days, for example, I’ve particularly enjoyed the stories from the business classes of Vicky Loras, and how Michelle Worgen is tiptoeing towards Teaching Unplugged in So This is English. David’s post on behaviour in Reflections of a Teacher and Learner was probably the most influential for this post, whilst the two guest posts on Ken Wilson’s Blog by Ania Kozicka and Vladka Michalkova show the creativity and imagination that teachers all around the world are coming up with. The ELTchat got me onto Twitter as well, and here I really see how much people enjoy getting together at actual real conferences, meeting up, learning from and with others, daring against all hope for a moment of epiphany. I love conferences too, and although I’m new to the blogosphere, I notice the similarity in warmth and excitement. All of which got me thinking. I liked school, but it was not without its moments. One seems especially significant to this mood. My geography teacher – and I really liked geography, and still do, it’s how I became an EFL teacher, I wanted to experience all these countries I’d read about in books – he showed me his folders from his university days. It was an attempt to make me pull my socks up, a call to arms. His folders were beautiful, and he was rightly very proud of them. They were A5 in size, so they had that dusty book feel. And his handwriting, it was so tiny, delicate but robust, slanting forwards like so many left-handers’ do, a dark blue fountain pen the tool of his trade, and it was all perfectly positioned just ever so slightly above the lines. There were paragraphs and indentations, sub-headings and footnotes, all without a single mistake. Here I was with the Venerable Bede, for it was his Bible to the physical landscape, an uncorrupted, incorruptible temple to the cause and effect of river drainage systems and soil erosion. It reminds me of an anecdote, the author of which I’m afraid I cannot recall, but it was told by a lady, a lady who had spent time in the company of Gladstone and Disraeli, two heavyweight British politicians, both prime ministers in their day, round about the start of the last century, fierce adversaries who were always vying with each other for the upper hand. 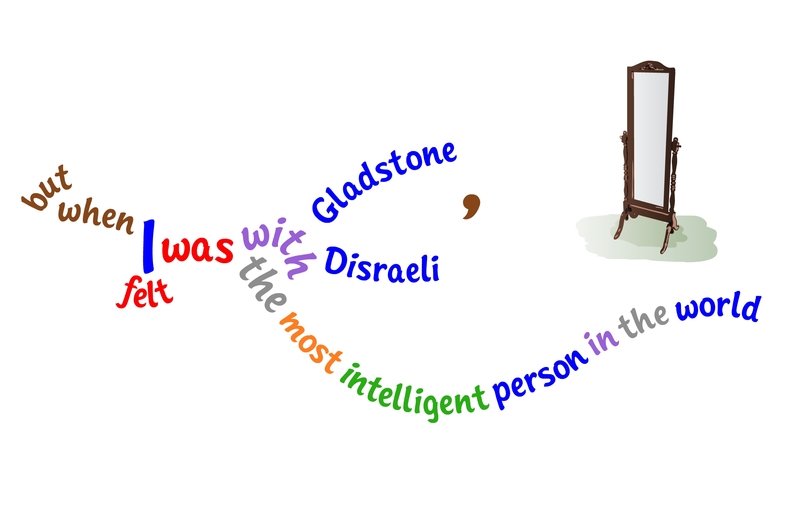 “When I was with Gladstone,” she had said, “I felt I was with the most intelligent person in the world.” I admit, I didn’t feel my geography teacher was actually the most intelligent person in the world, but standing there in his office, being made to admire his perfect words, sitting pristinely above the lines, I knew I was a woefully inadequate school boy. And so here I am, 6 years later, travelling and working and swimming with dolphins, doing all the things that we EFL teachers do, and I find this book, The Mind Map Book. Would you like to hear my other joke? But heavens! What a book. 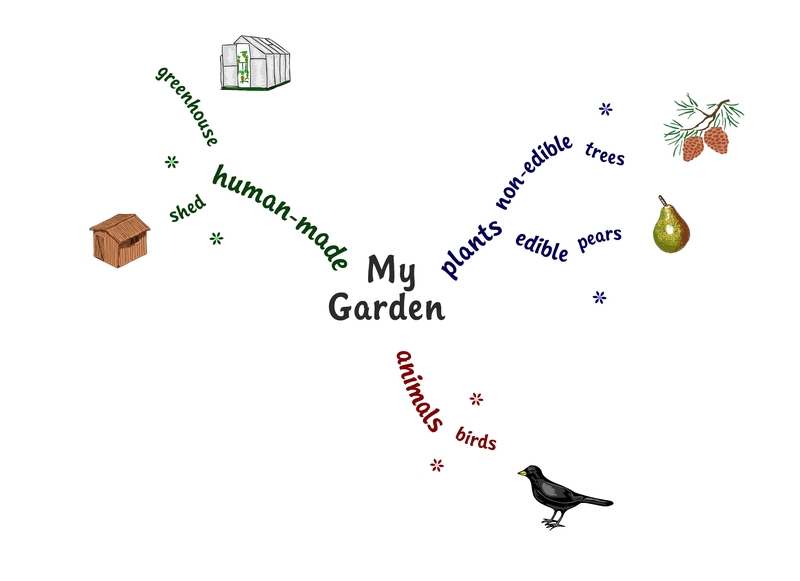 It’s where I first learnt about Mind Maps, like the one at the start of this post, where by clicking here, you can click on the little flowers to reveal more words. Before you do though, think about what words you’d fill into the Mind Map instead. It’s about things you can see in your garden, if you’re lucky enough to have one, or in someone else’s, if you’re nosy enough to peek. Now this book did change my life. It activated a mental model in me that had been lying dormant, a way of looking at the world, in this case learning and pedagogy, which until this moment I was unaware existed. The superiority of linearity that I had been forced to laud was, I suddenly, completely and amazingly discovered, not the only paradigm of perfectionism. And now you should see all my note books I’ve got around my study. I’ll happily spend time flicking through them with anyone who cares to look. Of course, they’re nothing like my geography teachers’. Absolutely nothing. No lines for a start, just blank white pages. Lovely pure white-as-the-driven-snow pages, when I first make one. I’ve got one of those big lever-arch hole punchers, and with a few bits of wool, tie the book together by looping them through the holes. Now it can be that a blank page is the most stifling obstacle to creativity known to man and woman. It’s too perfect to soil and spoil with incomplete, illogical and impractical nonsense. So of course the first thing I do when I start a new one is to just write something, usually carrying on from the end of the last one, usually somewhere in the middle of the page, a few words, maybe quite big, waving around in this lost expanse. Then follow little words, and maybe some bigger ones, and then there spring up lines and arrows and asterisks and symbols and pictures and colours everywhere. These are my Bibles, my Bibles to learning, and as such, they’re fluid, dynamic, and organic. They reflect my state of knowledge at any one time, which is different from yesterday and different from tomorrow. That’s why I only ever use a pen to sign cheques. All other times, it’s pencils all the way. I’ve got loads of erasers and at least four pencil sharpeners. I can see two just to my left as I write. You can’t be forced to admire something, or respect it, or emulate it. Or someone for that matter. So as teachers and teacher trainers, I think what we can do is carry on being who we are, so that if, fortuitously, someone does stumble upon our work, and they happen to be harbouring an inactive mental model that fits in with ours and which is just dying to be unearthed and engaged, whether by us or by them, then they will go away feeling that they can conquer the world, that they have found what they weren’t even looking for. I liked your post very much, thanks. I know that computers and all other gadgets are amazing but I still love making notes with a pen, pencil or crayon (ha ha:)). It really has some magic in it. And concerning Mind Maps, I absolutely adore them. I used them since my university studies but it was only last year when I discovered an “upgraded” version of them. It was on the conference where Jonathan Coxall was giving a speech. He talked about how to make notes using the mind maps…and it was brilliant. Just right now I am working on one named “My Classroom” which I am presenting in November at TESOL France. I will post it later on my blog to share it with all. Nice and creative way of making notes! Fantastic first post! I’m so glad you entered the blogosphere. It’s amazing how twitter is powerful, we often come across to awesome educators who are willing to share and learn ideas. You are on the right way! Concerning to Mind Maps, I think they play an important role in students’ learning process. So as teachers and teacher trainers, I think what we can do is carry on being who we are, so that if, fortuitously, someone does stumble upon our work…then they will go away feeling that they can conquer the world, that they have found what they weren’t even looking for. Just wanted to let you know… I did stumble across your blog yesterday and I loved it… made me long to try out a bit of language gardening but wasn’t sure if I could do it. Then today in class it all clicked into place I saw the connections and I ended up producing one on my very own board. I’ll post a picture later if you’re interested 🙂 but just wanted to say thanks – you’ve helped me uncover a little bit of who I am by being who you are in this public space! I can’t tell you how heart-warming your comments are. Thank you indeed for writing them. You are currently reading Reflection at language garden.